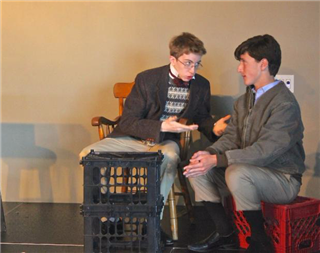 Theater Students performed for parents and guests as a finale in all three Upper School theater classes. In Intro and Honors Theater, audiences experienced some of the traditional scenes that have served as rites of passage over the last few years: Shakespeare monologues, The Misanthrope, Our Town, Fences, Proof, and 4000 Miles. In Advanced Theater Arts and Directing, students created original performances based on a play calledPhillip Glass Buys a Loaf of Bread, a piece akin to spoken word opera. Students wrote, arranged, designed, publicized and performed their pieces based on a directorial concept. The results, carefully wrought and colorful, exceeded all expectations.